We've gotten into spirited arguments about what's the best fruit in pancakes. If you're on team blueberry then you can come sit with us and check out this easy recipe for blueberry pancakes. 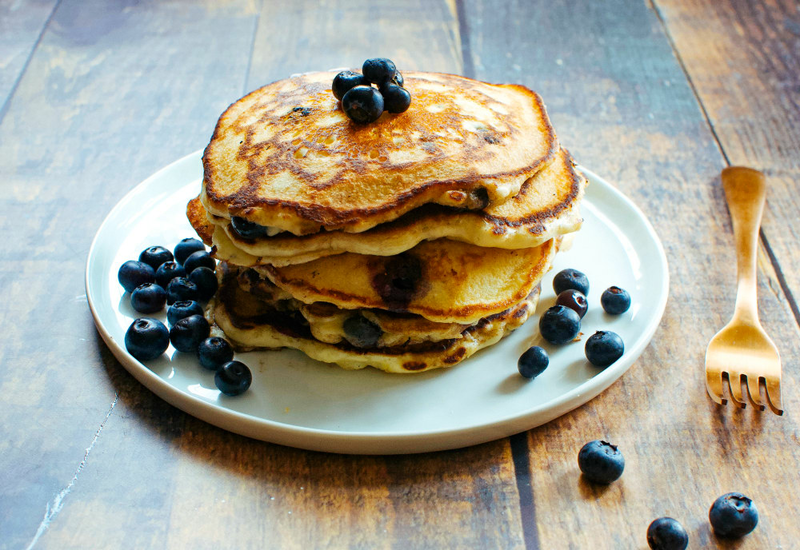 It's pretty quick to make and will yield moist and fluffy pancakes studded with blueberries. We especially love to serve them with warm maple syrup—and don't get us started on real versus fake maple syrup. (We're just very passionate about having the most delicious food!) These pancakes are the perfect weekend morning breakfast the entire family is sure to love. Do the people at the table argue over who got more blueberries in their pancakes? Then keep the peace with this tip for achieving a more even distribution of blueberries: Instead of mixing the blueberries into the batter, drop them into the pancake one-by-one right after you ladle the batter into the pan. Per Serving: 231 calories; 9g fat; 32.0g carbohydrates; 6g protein; 49mg cholesterol; 718mg sodium. Hands down my favorite blueberry pancakes recipe. I make these every weekend. It's so easy to make, requires simple ingredients, and easily make about 1 dozen pancakes. Can't go wrong with this one at all. I love this blueberry pancake recipe! They are so sweet and delicious. One of the best things about these pancakes is how quick and easy they are to make. Perfect for Saturday or Sunday mornings when you want something good! This is my favorite pancakes recipe. The only change I make is I use buttermilk. Also, fresh wild blueberries work best. I've made this a few times and even subbed frozen. Definitely go with fresh! I used to always buy boxed instant pancakes, but since stumbling upon this recipe it's the only one I make now. Frozen blueberries work just fine! These blueberry pancakes are a staple in my house. This recipe works with both frozen and fresh berries, but I prefer the smaller wild blueberries! I make my pancakes smaller than the average, and I can get at least 24 mini pancakes from this batch.